It may be challenging to pay medical bills and take time off from work after a serious injury. Many people feel tremendous anxiety about how they can take care of their bills. If you were hurt due to someone else's negligent or wrongful actions in Detroit, the dedicated personal injury lawyers at Moll Law Group can explore the facts of your case and sue the appropriate parties on your behalf. Michigan residents may be able to recover compensation from a manufacturer if they are injured by a defective car component, medication, medical device, appliance, or other product. Defects are imperfections that make a product dangerous even for a reasonably foreseeable use. For example, when a product line is planned such that a specimen of the line poses unreasonable risks to consumers or users of the product, it is likely that there is a design defect. If you are hurt by a medical professional who failed to abide by the accepted practices of their specialty and thereby caused your injuries, you may be able to sue for compensation. Michigan medical malpractice lawsuits usually may be filed within two years of a doctor or other medical professional's negligent action or omission that caused injuries to a patient. It will be important to introduce expert testimony to explain how the care that you received fell short of the appropriate standard. In nursing home negligence lawsuits, a resident suing for compensation must establish that their nursing home failed to provide the level of care required in a licensed nursing home and that this negligence caused their injuries. The harm may include pain and suffering, loss of enjoyment, and medical expenses. Our firm can review all of the records associated with a resident's care, as well as any investigative findings, to see whether a lawsuit is appropriate. In Michigan, you may be able to bring a lawsuit for compensation if you are hurt as a result of a dangerous condition on someone else's property. The condition of the property must be under the defendant's control. In some cases, it may be more appropriate to bring a general negligence claim, which arises out of a defendant's activities on a piece of property. Michigan is a no-fault state. This means that after a car accident, an injured driver must turn first to their own car insurance policy for compensation. However, some accidents cause injuries that are so severe that an accident victim may be able to bring a lawsuit against an at-fault driver. In Michigan, when a car crash causes a serious impairment of a body function or permanent disfigurement, the victim may hold an at-fault driver accountable through the legal system. Corporations sometimes commit acts that put profits ahead of the wellbeing of people who live near the corporation or work in it, and these acts may cause harm many years down the road. For example, before regulations were instituted to prohibit the use of asbestos, many workers were exposed to asbestos on the job. Years passed before they developed mesothelioma as a result. If you suffered injuries because of exposure to toxic chemicals or substances released through a corporation's negligence or reckless disregard, we are available to bring a toxic tort lawsuit on your behalf. If you have been hurt due to someone else's negligence or misconduct, you may have grounds to bring a personal injury lawsuit. 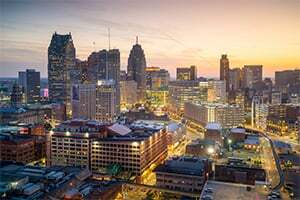 Vigorously advocating for victims in Detroit, the personal injury attorneys at Moll Law Group care about people who are dealing with the aftermath of serious accidents. Billions of dollars have been recovered in cases in which we have been involved. Call us at 312-462-1700 or complete our online form for a free consultation with a product liability attorney or guidance with another personal injury claim.